When it is already cold outside, a warm jersey sweater will be useful clothing for every boy. Kenzo offers a bright blue outfit of high quality fabric. It attracts boys by a stylish roaring image of a tiger and a logo of the brand on the front of the sweater. It will look nicely with a pair of denim jeans. A short sleeved white shirt by Fendi is a good choice to dress your boy when it is warm outside. The top is embroidered with a monster print of pale blue color and signature of the brand. The shirt will look stylish with a pair of denim jeans or shorts. Polo T-shirts are very popular among young boys and teens. Ralph Lauren offers this turquoise cotton polo T-shirt with short sleeves for your kid. A coral pony as the logo of the brand is embroidered on the chest. Polo shirt is a nice addition to a wardrobe of every boy. Summer is a good season for expressing our individuality by brisk and vivid colors. These bright blue trousers are good for positive guys. They are made from cotton of high quality are promise to provide comfort. The trousers can be dressed down with a nice shirt. 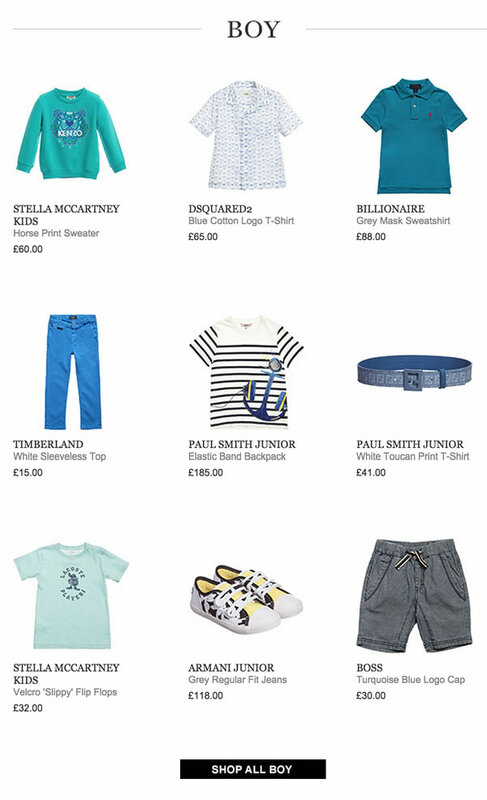 White striped T-shirt with short sleeved by Junior Gaultier will be adored by young boys and their modern parents. A big attention is paid to a print of a telephone in the shape of anchor. An important accessory in a wardrobe of a boy is for sure stylish belt. Fendi offers a nice belt made from cotton with leather back. It is embroidered with print of the logo of the brand. It can be worn with fancy denim trousers. Lacoste offers to its fans a new design of a classic T-shirt. This short sleeved top creates a stunning look thanks its gentle peppermint green color. The brand’s logo – a crocodile in a sporty shape – is placed on the front of the T-shirt. These cool canvas pumps by Kenzo promise to be adored by many teens. All over palm tree print is represented with black and pale lemon color. Velcro fastening is a big advantage, as it makes its easy to put on and take off. The shoes can be worn with a nice colorful or plain T-shirt. Molo created soft cotton blue shorts with a denim effect for young boys. The elasticated waist makes a good fitting. The shorts will definitely look lovely with nice white T-shirt.